KAMPALA – A 43-year old man was yesterday sentenced to 40 years in prison for brutally murdering his wife a city businesswoman, Josephine Namanda in 2014. Kassim Kakaire pleaded guilty to pouring acid on his wife’s which later caused to death and also leaving him injured with lifetime wounds and pain. During the plea bargaining where he admitted committing the offence in order to be handed a lenient sentence by the trial judge Anthony Ojok Ayuko, Kakaire told court that he had lost his first wife due to cheating something he did not want to happen again to his second wife. Kakaire who was crying while begging court to forgive him further said he did not want his wife to die but rather wanted to only destroy her beauty. Before heading him the 40 years in jail, the judge heard from the deceased’s elder daughter Carol Nassiwa who asked court to sentence Kakaire to 80 years in prison saying that she has suffered a lot together with her siblings yet her mother will never come back to them. The trial judge noted that the maximum sentence of murder under the sentencing guidelines is to suffer death which he said he will not go to that extreme. “The convict is 43years now. If the co-accused were given 25 years I find the 40 years appropriate minus the 4years on remand leaving the accused with 36years. You have a right to appeal with in 15days in case you are not satisfied with my sentence,” Justice Ayuko ruled. ation number UAG 693K by the time of the attack. 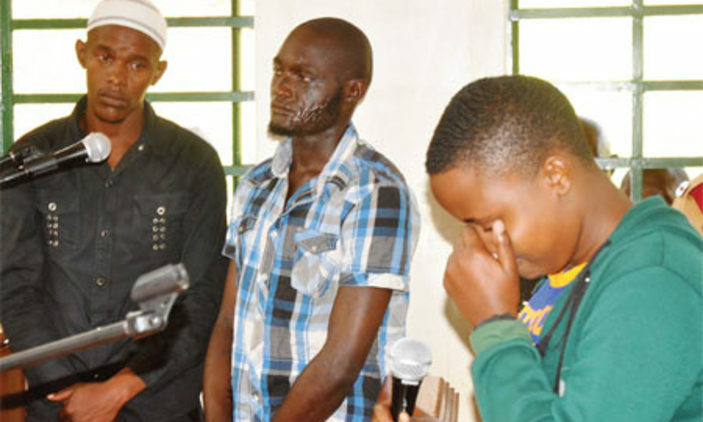 with Namanda , hired two people at Shs3 million to pour acid on her . Police investigations established that on the fateful day, the couple was travelling from Jinja after attending a christening ceremony of their two weeks old daughter by Kakakire’s family.